Last week, we recalled the beautiful story of Juan Diego and our Lady of Guadalupe. This week, we address the scientific studies on the tilma and its symbolism. Since 1929, the Church has permitted various scientific studies to be performed on the tilma. The earliest studies detected reflected images on the eyes of the Blessed Mother, namely, those of Juan Diego and two other persons (probably one being Juan Gonzalez, the interpreter for Bishop Zumarraga). The images have a slight distortion, due to the natural curvature of the cornea and lens of the eye. These findings have been repeatedly confirmed. Interestingly, Dr. Charles Wahlig, a nuclear physicist, posited that the Blessed Mother must have been invisibly present when Juan Diego was presenting the roses to Bishop Zumarraga and that the tilma acted like a photographic plate which captured her image and the reflection of their images in her eyes. Infra-red studies also revealed other unexplainable phenomena: The image was not painted, and the color did not penetrate the fibers as would paint. Weaving with such irregular fibers also produced a rough surface which would have distorted any simple surface painting, yet the image one sees is clear and undistorted. Moreover, the tilma should have deteriorated long ago. It was not sized and has no protective coat of varnish. Anything of cactus fiber would have deteriorated within one hundred years, especially when exposed to the pollution, candle soot, and the like. Nevertheless, the tilma remains. Dr. Philip C. Callahan, a biophysicist, concluded, "The original figure including the rose robe, blue mantle, hands and face... is inexplicable. In terms of this infra-red study, there is no way to explain either the kind of color pigments utilized, nor the maintenance of color luminosity and brightness of pigments over the centuries. Furthermore, when consideration is given to the fact that there is no under-drawing, sizing, or over-varish, and that the weave of the fabric is itself utilized to give the portrait depth, no explanation of the portrait is possible by infra-red techniques. It is remarkable that in over four centuries there is no fading or cracking of the original figure on any portion of the ayate tilma, which being unsized, should have deteriorated centuries ago" (Mary of the Americas, p. 92). 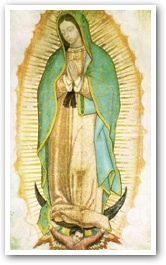 The image of our Lady of Guadalupe also has great symbolism. Although in this article we lack a picture, the following information can be used later. Our Blessed Mother's image surrounded by luminous light, standing on the moon, and with stars on her mantle reflects the description found in the Book of Revelation: "A great sign appeared in the sky, a woman clothed with the sun, with the moon under her feet, and on her head a crown of twelve stars" (12:1). These are also symbols of divine victory over the pagan religion. Sun rays were symbolic of the Aztec god Huitzilopochtle. Therefore, our Blessed Mother, standing before the rays, shows that she proclaims the true God who is greater than Huitzilopochtle and who eclipses his power. She stands also on the moon. The moon represented night and darkness, and was associated with the god Tezcatlipoca. Her again, the Blessed Mother's standing on the moon indicates divine triumph over evil. Moreover, in Christian iconography, the crescent moon under our Lady's feet also symbolizes perpetual virginity and is connected with her Immaculate Conception and Assumption. The stars on her mantle indicate that she comes from Heaven, as Queen and loving Mother. Interestingly, the research of Father Mario Sanches and Dr. Juan Hernandez Illescas of Mexico attests that the stars on the mantle appear exactly as they would have in the sky before dawn on the Morning of December 12, 1531. The face of our Blessed Mother, with its complexion, dark hair, and dark eyes, reflects the physiognomy of an Indian. Her eyes are also cast downward, showing humility and compassion. Also, in Indian iconography, a god looked straight ahead with wide-open eyes; the picture here then shows that Mary does not claim to be God, but only His messenger and loving mother. Our Blessed Mother is supported by an angel, a symbol of royalty for the Indians. Some interpret this image as a sign of our Blessed Mother announcing a new age to come. Her clothing also has special significance. The rose color of our Blessed Mother's dress has two interpretations, either as a symbol of the dawn of a new era, or as sign of martyrdom for the faith. The gold brooch under her neck represents sanctity. Finally the bow around her waist is a sign of virginity. However this bow has several other meanings in Native Indian culture: this bow was the nahui ollin, the flower of the sun, which was a symbol of plentitude, fecundity, and new life. The high placement of the bow and the apparent swelling of the abdomen of the Blessed Mother have led some to conclude that Mary is pregnant. Obviously, the tilma has been a great source of devotion, especially for the Mexican people. However, evil has tried to prevail, but has failed. For example, in 1921, during the fanatical reign of General Calles who outlawed Catholicism, a bomb was planted in the basilica in hopes of destroying the tilma. The bomb reduced to rubble the marble altar below the tilma, shattered the windows, and twisted the heavy bronze altar cross. Yet, the tilma and even its glass covering were untouched. Just as Mary's apparition testified to the triumph of true religion over the bloodthirsty paganism of the Aztecs, even in this case, she overcame the forces of evil. Today, thousands of pilgrims go to Guadalupe to reverence the holy image. While Hispanic Catholics have a special devotion too Our Lady of Guadalupe, she rightfully deserves the devotion of all people living in the Americas. For further information, the following books are very interesting: Our Lady of Guadalupe and the Conquest of Darkness by Dr. Warren Carroll, and Mary of the Americas by Fr. Christopher Rengers. Saunders, Rev. William. "The Tilma's Symbolism." Arlington Catholic Herald.